The course catalog includes academic organization, admissions, registration, financial aid, academic standards and policies, degree & certificate programs, Associate of Arts degree requirements (9000), Associate of Science degree requirements (9100), articulation agreements, transfer module, course descriptions, faculty, advisory committees, administration, supervisory and professional staff, board of trustees, and The Lakeland Foundation. 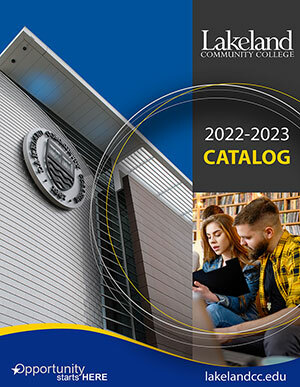 Lakeland Community College offers more than 1,000 credit courses and numerous programs to fulfill its mission to provide quality learning opportunities to meet the social and economic needs of the community. Our associate degree transfer programs allow students to take the first two years of a traditional four-year college or university curriculum on campus. Lakeland offers specially designed sequences leading to the awarding of certificates that have been developed in cooperation with industry, commerce, and local government to provide opportunities for persons seeking to improve their occupational skills or to retrain for new occupations.